Eric Howard was born in Bermondsey, inner city London during the1950's. Following a secondary modern school education, he took a job as an assistant photographer, age of sixteen. Two years later, he became freelance professional photographer, and his clients list soon included: The Times, IPC Magazines, National Magazines, Virgin Records, Phonogram Records, and RCA Records. He also sold original prints through Sotheby's and the Photographers Gallery, London. During this time, Eric decided to branch out into publishing calendars. He designed a totally new calendar presentation system using plastics. Amongst the calendars published were: Lamb's Navy Rum, The Tate Gallery, Agfa, John Swannell, Bob Carlos Clarke and the Royal Institute of British Architects. Eric sold the copyright for his calendar presentation system and returned to his photographic art. Clients included Lord Palumbo, Viscountess St.Germans, Mrs Sally Cadbury, The Royal Photographic Society and The Financial Times. During this period Eric designed and manufactured the Demi-Case, a simple attractive carrying case for Artists & Photographers made from a lightweight corrugated plastic. He also sold this copyright which is now a commonplace product. He covered the orphanage crisis after the collapse of communism at the request of Mary Gibson, founder of The Romanian Orphans Fund. The resulting photographs were featured in TIME Magazine, raising many thousands of pounds for the fund. The Arts Council only funded galleries that promoted non-commercial work, whilst most British Photo artists struggled to survive. So Eric created the publication, 'PhotoArt for Sale Magazine'. He personally designed the magazine, and brought on board many fellow photographic artists, attracting sponsorship from: Christies, Hamilton's Gallery, Agfa, Contax, Nikon, Ilford, Conservation Resources, Stephen Cohen Gallery Los Angeles, Leica Cameras, Fuji Film, Kodak and Polaroid. Two years later Eric's magazine was sold to a publisher who rebranded it. This new style unfortunately dropping the original intention of selling photographic originals. The Duke of Edinburgh Awards Scheme commissioned Eric to help organise a charity photographic auction at Coutts Bank in The Strand, London. He was singled out for thanks by Prince Edward, who was the Royal representative that night. 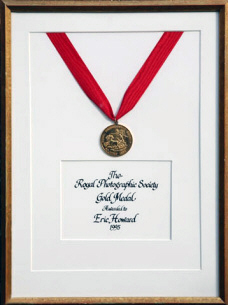 In 1995, Eric won the prestigious 'Royal Photographic Society Gold Medal' against competition from thousands of established photographic talents world wide. Eric devoted most of his time during this period to help protect rural communities which were under threat from the ban on hunting. He wrote to over 300 Labour MP's. His images were widely published to illustrate how key hunting & shooting were to country communities. A permanent exhibition of Eric's work hangs in the boardroom of The Countryside Alliance headquarters in London. Major exhibition at the international consultants 'McKinsey & Co', who thereafter decided to buy the entire exhibition for its own collection. Eric and his new young wife decided to move to Southern Ireland buying a small Irish mountain and farm. There he spent four years restoring the former farm and designing a large Super House. The Super House used cutting edge green technology and incorporated 17 feet high windows overlooking the Kerry Mountains. Despite being 3500 square feet, the house's carbon footprint was a mere 10% of a normal house. It is now considered to be one of the best designed houses on the famous Bera peninsula. After 2 years the Historical Ballroom was restored to its former glory with a modernist twist and a Roman temple dedicated to Medusa at one end. Eric had transformer it into the ultimate creative Work Space & Private Gallery ready for the next phase of this creative being's life "The Bath Art Project". Wiltshire's Rye Hill Art Space.